Richard Kaczynski, Ph.D., is a writer, musician, research scientist and teacher. He is author of "Perdurabo: The Life of Aleister Crowley," "The Weiser Concise Guide to Aleister Crowley," "Perdurabo Outtakes," and "Panic in Detroit: The Magician and the Motor City." 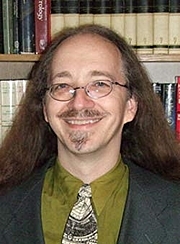 He has also co-edited with Hymenaeus Beta "The Revival of Magick and Other Essays," and performed editorial duties for "Beauty and Strength" (the NOTOCON VI proceedings book). He has appeared on television in the documentaries "Secrets of the Occult" and "Aleister Crowley: The Beast 666." Dr. Kaczynski earned his Ph.D. in social psychology, with a minor in measurement and statistics, in 1993 with a dissertation on metaphysical beliefs and experiences among occult practitioners in New Religious Movements. He has been a student of the Western hermetic tradition since 1978, and has lectured internationally on these topics since 1990. Over the years, his writing has appeared in various books ("Aleister Crowley and Western Esotericism: An Anthology of Critical Studies," "A Concordance to the Holy Books of Thelema," "The Golden Dawn Sourcebook," "Rebels and Devils," "People of the Earth") and magazines ("High Times," "The Magical Link," "Neshamah," "Cheth," "Mezlim," "Eidolon," "Different Worlds"). His latest projects include an edited and annotated edition of Aleister Crowley's "Sword of Song" (1904), and a history of sacred sexuality in esoteric societies during the 19th and early 20th centuries. He lives in Maryland with his wife and cats. Richard Kaczynski is currently considered a "single author." If one or more works are by a distinct, homonymous authors, go ahead and split the author. Richard Kaczynski is composed of 3 names. You can examine and separate out names.